Bone Shaker – This massive assortment includes 18 cakes and 66 different shells! What A Girl Wants Backpack - Convenient, affordable, reusable, age appropriate. Lipstick & cell phone fountains, chickens, snappers, confetti throwers and more. And after the fireworks are gone, she'll still have a pink backpack left. She's gonna love it, no doubt. Full Power - Snappers, 200g cakes, even mini artillery shells! - this smaller tray assortment covers all the bases! Rebellion - This assortment contains sparklers, snaps, ground spinners, some small fountains, more than a dozen small to mid sized 200 gram cakes, two tubes, and a dozen Cutting Edge Artillery Shells. A great value that will keep you going and going. 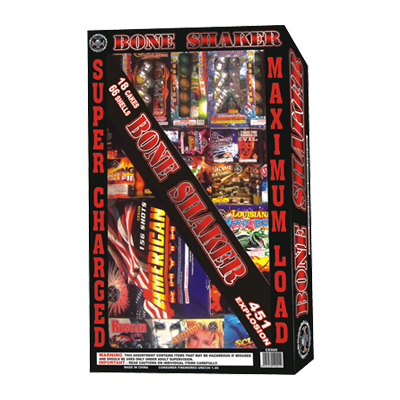 Shining Sky - Mixed assortments including fountains, 200G cakes, saturn missiles, roman candles and more.